Jaimey and Tina Irwin’s winning warm-ups. Now based at Stoney Lake Equestrian near Toronto, Jaimey and Tina Irwin trained in Germany and have devoted themselves to the German classical dressage system. For more than 15 years they trained with Holger Muenstermann, who has worked with some of the world’s best, and their training philosophy is based on his teachings. 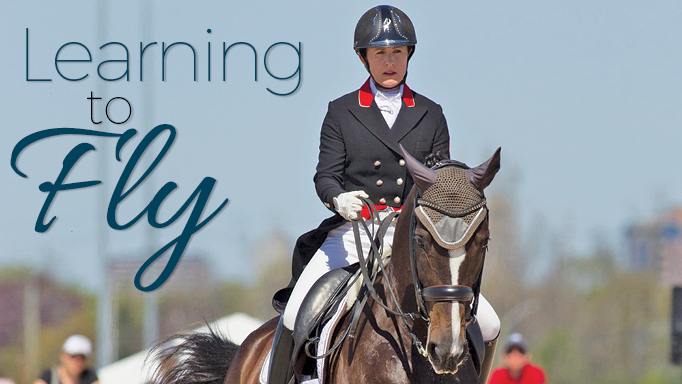 They believe every rider at every level can and should be using a consistent, systematic approach, whether schooling at home or riding at competitions. 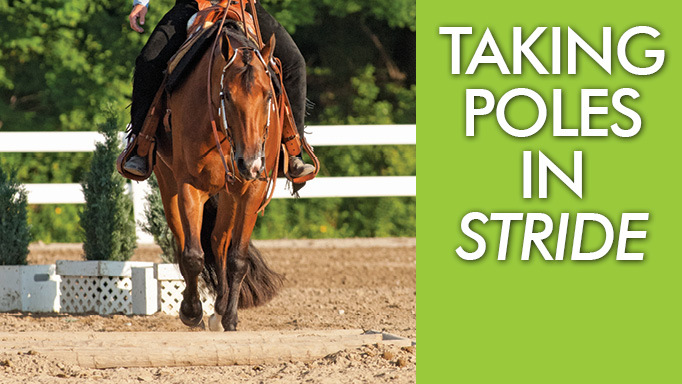 The Irwin’s daily warm-up routine begins with walking – either in-hand or under saddle – for at least 10 to 15 minutes to give the tendons, joints, ligaments and muscles proper time to warm up before transitioning to trot. After walking for at least ten minutes on a long rein, Jaimey and Tina begin to put the horses together at the walk, then begin rising trot while stretching long and low. They always start the trot work with longer lines and large 20-metre circles in both directions to let the horses warm up properly without asking for small circles or anything too difficult in the warm-up phase. Once they have stretched the horse at the trot in both directions, they do the same at the canter. They encourage the horses to canter forward freely down the long side of the arena, and also use 20-metre circles to bend them laterally after achieving a nice longitudinal bend over their topline. After the canter, they come back to the trot and stretch them once more in the rising trot before coming down to walk and giving them a long rein and a break. “This is our standard warm-up routine, but we do need to be flexible and make small modifications depending what each individual horse needs that day,” says Jaimey. When working with young horses, the Irwins often lunge them first if they have excess energy so that they are able to ride safely and effectively. These horses are hand-walked for 10 minutes prior to putting them on the lunge line. Once the lungeing is finished, they get on the horse and begin work in rising trot, but do not stretch until the end of the warm-up. In this case Tina suggests riding on more contact at the walk once mounted, and adding some leg yields to ensure the horse accepts the rider’s leg before beginning the trot work. If the horse is raring to go even after hand-walking, it may be best to trot off fairly soon after mounting. 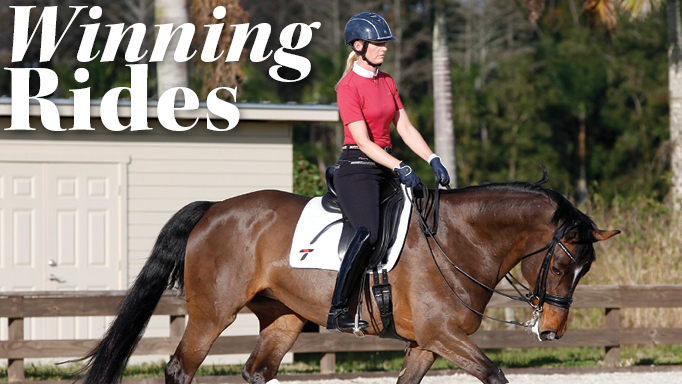 Long lines and large circles are still important in the warm-up phase, while adding transitions within the gaits is helpful to get a hot horse more focused and on the aids. 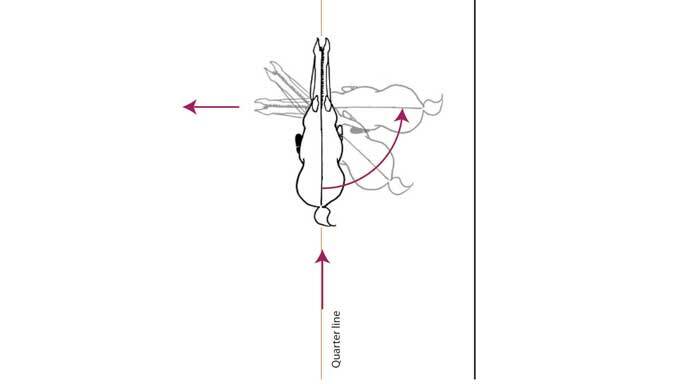 If the horse is not responsive to the half-halt during warm-up, transition to walk and make sure they are listening before returning to the trot. Tina and Jaimey recommend the same exercise to warm up a fiery horse in the canter, making canter/trot transitions and riding forward and back within the gait to keep the horse on the aids. On the other end of the spectrum, a lazy or more sluggish horse can be tricky to warm up at the walk for a long period of time, especially when they want to stop every couple of steps. When a lazy horse feels the rider’s leg at every stride, they may get dull to the aid and not react anymore. Therefore, even in the warmup, the Irwins believe a lazier horse must be ridden with less leg overall, and with shorter, quicker leg aids to get a reaction. Next month: Phases 2 and 3: Working phase and cooldown. Perfecting the flying change, with Meredith Risk. Riding Dressage and the Big O(uch)! 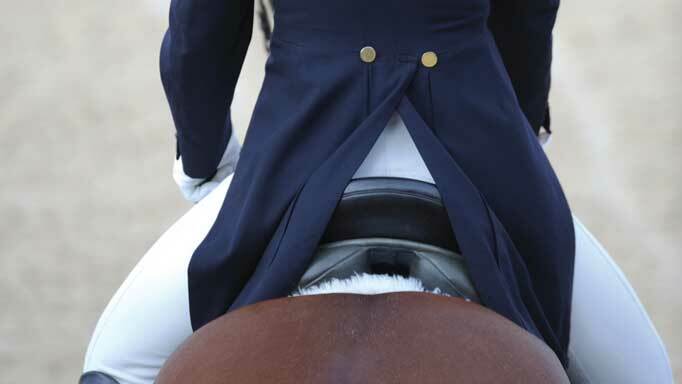 For most of us, it is an unavoidable initiation into the sport of dressage. Sitting trot hurts.